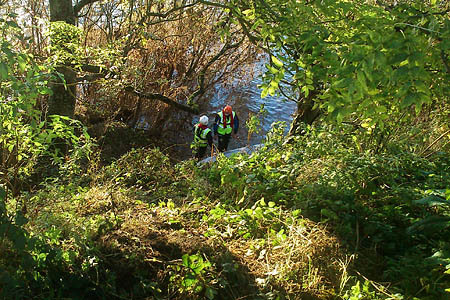 A rescue team helped retrieve the body of a missing man from a river in the Scottish Borders. Border Search and Rescue Unit joined the search for the missing man in his 60s today, along with the Underwater Search Unit on the River Tweed in the Ladykirk area. Border SARU spokesman Damon Rodwell said: “Three members of the dive team and 11 from BSARU were deployed to search the banks and the river for a man in his 60s, for whom concern had been mounting through the day. The search took place on the Tweed, which forms the border between Scotland and England in the area. Mr Rodwell said: “Fire and rescue crews from both sides of the border had been involved earlier in the day, and an aerial search by a helicopter from RAF Boulmer had been unable to locate the body. “The recent heavy rain and exceptionally high river levels had made the steep sections of the bank particularly hazardous, and the search was hampered by dense and slippery vegetation. He said today’s operation followed three recent urban searches for the team in the Central Belt. The Border Search and Rescue Unit provides mountain rescue cover in the south east of Scotland. The Kelso-based team will mark its 50th anniversary next year.